Who doesn’t love good chocolate and a good book? 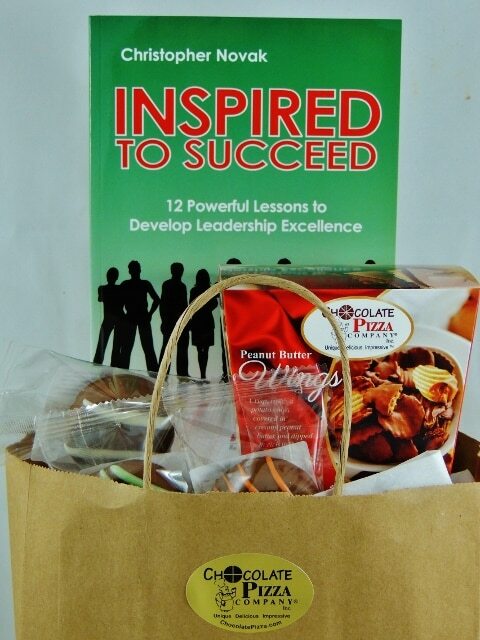 We took the brown bag lunch and added your choice of an inspiring book and the best tasting chocolate you’ve ever had to create a learning moment like no other. 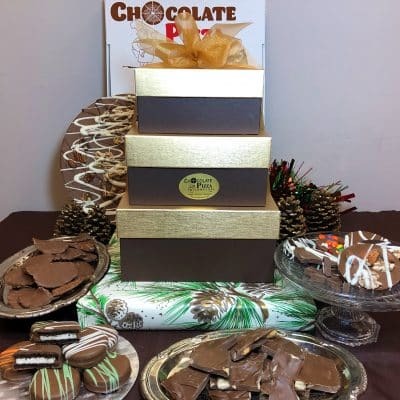 Brown Bag Lunch and Learn offers one of 4 powerful, quick-read books, Peanut Butter Wings (8 oz) and 3 chocolate covered cookies all in a handled brown bag – nothing fancy, just incredibly memorable. You’ll want to pick up a brown bag lunch and learn for your entire team – they’ll think you’re the best boss on the planet (and they’d be right). Or, just treat yourself – you’ve earned it. Book Choice Choose an optionConquering Adversity: Six Strategies to Move You and Your Team Through Tough TimesInspired to LeadInspired to SucceedPirates of St. Croix: Lead Like a Pirate! Who doesn’t love chocolate and a good book. We took the brown bag lunch and added your choice of an inspiring book and the best tasting chocolate you’ve ever had to create a learning moment like no other. 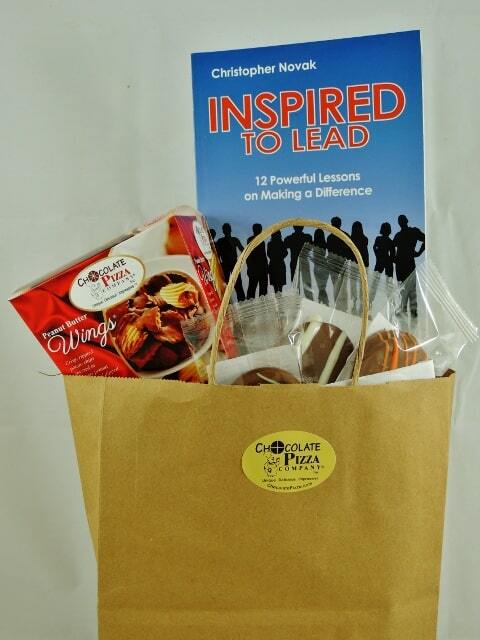 Brown Bag Lunch and Learn offers one of 4 powerful, quick-read books, Peanut Butter Wings (8 oz) and 3 chocolate covered cookies all in a handled brown tote bag – nothing fancy, just incredibly memorable. Conquering Adversity: Six Strategies to Move You and Your Team Through Tough Times is a book that you won’t put down. Set against the backdrop of tragedy, Conquering Adversity features six strategies for moving forward with passion and purpose no matter what the challenges. It is as inspiring and applicable personally as it is professionally and offers real-world insight for overcoming any setback. It also provides a glimpse into the climb from tragedy to triumph that Chocolate Pizza Company owner, Ryan Novak, made after losing his mom at age 9. Written by his dad and the topic of keynote presentations nationwide, the book chronicles how to handle difficult times and has been a much-praised resource to thousands of people from all walks of life. Powerful, practical and a book you will return to time and time again. 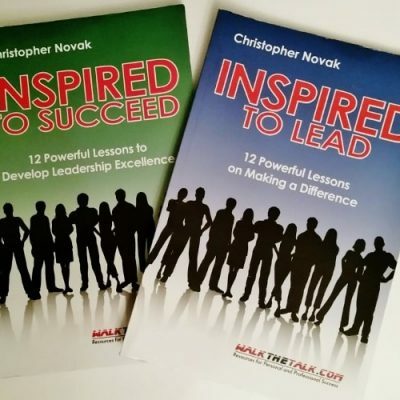 Inspired to Lead and Inspired to Succeed are two books that deliver a dozen inspiring vignettes and the leadership lessons behind the stories. Drawn from a broad spectrum of real-world experiences, they highlight how everyday challenges or situations provide opportunities to learn valuable lessons about being an effective leader. Unique as a professional resource, these books go beyond the story to the underlying nuggets of wisdom that each of us can take away and apply in our own journey as leaders. 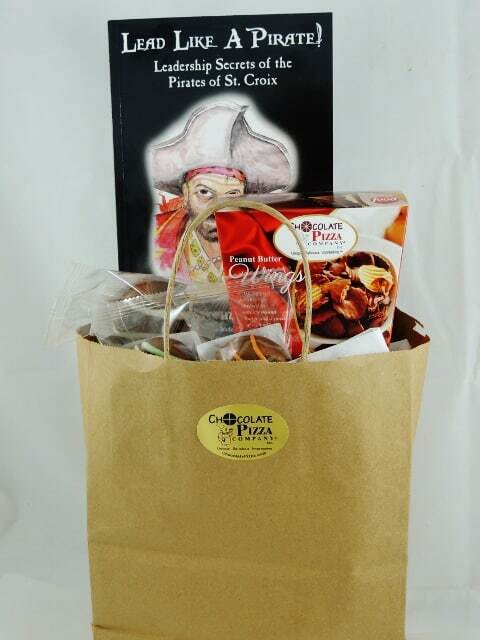 Lead Like a Pirate: Leadership Secrets of the Pirates of St. Croix is professional development framed in the golden age of pirates, when transforming a diverse set of skills, backgrounds and attitudes into a fiercely effective crew was the difference between success and catastrophe. Lead Like a Pirate is fun without being entertainment – insightful without being boring – think of it as themed-learning in an easy to read, witty narrative. Of course, there is good chocolate to go with good books. We’ve included an 8 oz. 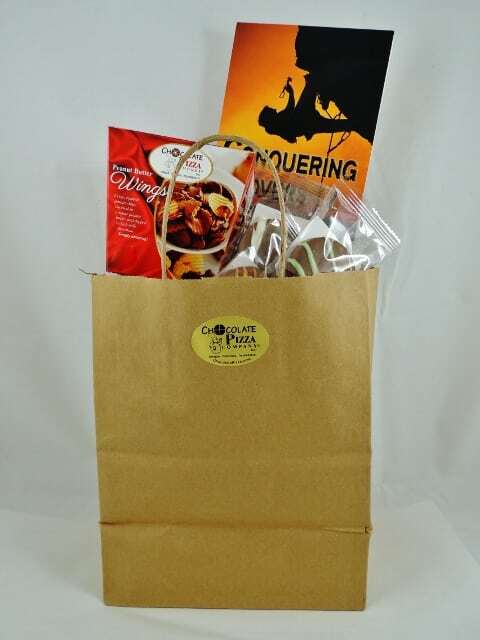 container of Chocolate Pizza Company’s famous and best-selling Peanut Butter Wings. These crisp, rippled potato chips are covered in creamy peanut butter and drenched in milk or dark chocolate – insanely delicious. 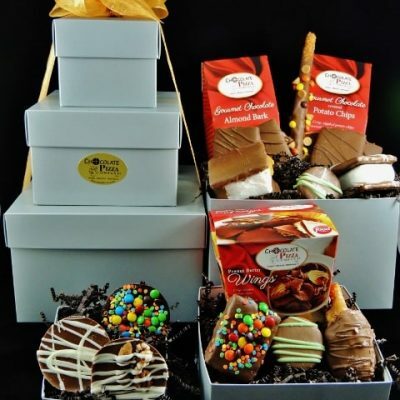 And to complete the chocolate treats, 3 chocolate covered creme-filled cookies in vanilla, mint or peanut butter flavors. It’s brown bag heaven! You’ll want to pick up a brown bag lunch and learn for your entire team – they’ll think you’re the best boss on the planet (and they’d be right). Conquering Adversity: Six Strategies to Move You and Your Team Through Tough Times, Inspired to Lead, Inspired to Succeed, Pirates of St. Croix: Lead Like a Pirate!